The spine of Baja California Sur between Los Cabos and La Paz is the interior mountain range of the Sierra de la Laguna. It may not be Nepal, but this rocky range reaches as high as 7,000 feet, and intrepid sorts are welcome to scale its highest peak: El Picacho de la Laguna. Or attempt to, anyway. We should mention that in addition to small, cuddly and adorable deer, the mountains of Baja Sur are also home to a bewildering array of scorpions, spiders and exotic rattlesnakes. It’s safer, easier and a lot more fun to go zipping pell-mell amid the surrounding foothills. 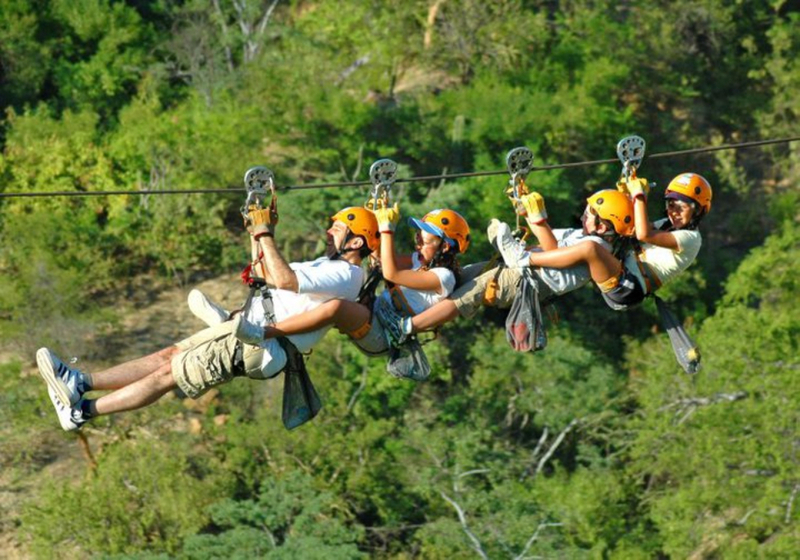 Cabo Adventures’ zip line course in the beautiful Boca de Sierra Biosphere Reserve includes the longest single line in México, a nearly mile-long plunge (around 4,000 feet, anyway) in which participants reach speeds of up to 60 miles an hour. To reach this point, one must first manage an obstacle course that includes cliffside rappelling and a swinging wooden bridge suspended high above the earth. Wild Canyon, Baja’s biggest theme park, offers similar heart-pumping plunges through mid-air, albeit in the foothills of El Tule canyon. Wild Canyon may be able to top Cabo Adventures’ longest zip line, but they do have a trump card: zip lining by moonlight 3oo feet above a not very soft canyon floor. If the combination of a full moon and high-flying adventure doesn’t scare you, may we recommend a bungee jump from a glass-bottom gondola? Cabo Adventures, Blvd. Paseo de la Marina, Lote 7-A, Cabo San Lucas Marina, Cabo San Lucas, (624) 173-9500 in México, (888) 526-2238 in the U.S. and Canada, info@cabo-adventures.com, www.cabo-adventures.com. Open daily 7 a.m. to 6 p.m. All major credit cards accepted. Use Promo Code CABOVIVO18 for a 20% discount on all activities and adventures. Wild Canyon, El Tule Bridge, Los Cabos Tourist Corridor, (624) 144-4433 in México, (866) 230-5253 in the U.S. and Canada, mkt@wildcanyon.com.mx, www.wildcanyon.com.mx. Open daily 9 a.m. to 9 p.m. All major credit cards accepted. The most famous sporting event in Baja is also the most famous off-road racing event in the world: the legendarily rugged Baja 1000. So devilish and dangerous was this annual off-road trek through the untamed heart of the peninsula that by the late 1960s and early 1970s it became a badge of honor, one that attracted Hollywood stars of the era like Paul Newman, Steve McQueen and James Garner. Even traditional motorsports stars like Indy 500 winner Parnelli Jones and 7-time NASCAR Cup champion Jimmie Johnson felt the need to try it, as if driving fast over paved roads wasn’t enough of a challenge. Nowadays, you don’t have to commit to a 1,000 miles to experience the thrills and metaphorical chills of off-road driving in Baja. 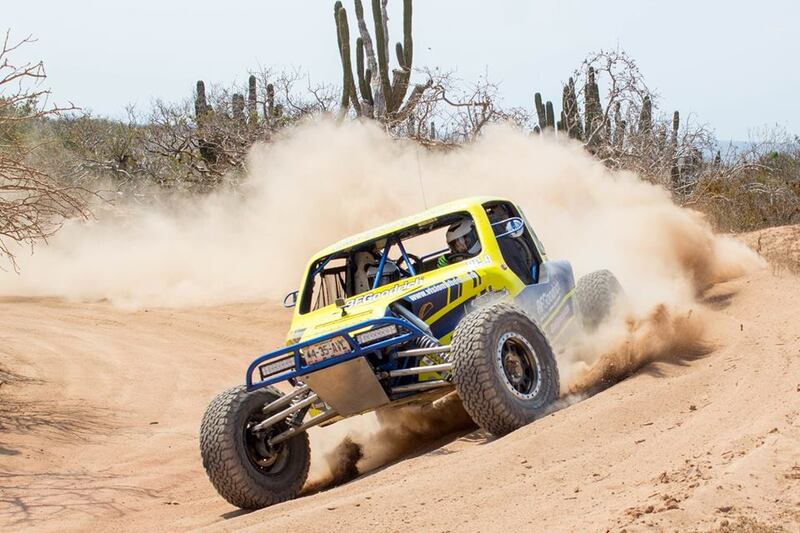 Numerous companies offer dune buggy adventures across beach, desert and mountain terrains north of Cabo San Lucas, and at least one local company – Wide Open – offers adventures in actual Baja 1000 style race cars. As a matter of fact, they’ll even let you enter one of the regional SCORE sponsored races, and offer in-race communications and other technical support. All you need to provide is plenty of nerve and a valid credit card number. Wide Open Baja, Paseo de la Gaviota (behind City Club), Cabo San Lucas, (624) 105-0500 in Mexico, (949) 681-8200 in the U.S., info@wideopenbaja.com, www.wideopenbaja.com. Open weekdays, 8 a.m. to 4 p.m. All major credit cards accepted. Photo credit: Wide Open Baja. Los Cabos tour companies have been ferrying vacationers to La Paz for years to swim with the world’s largest fish. 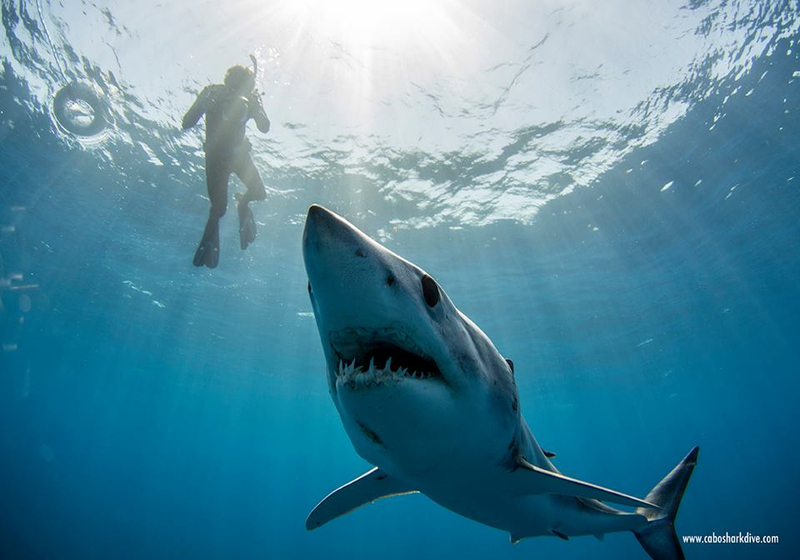 For those bored with the idea of swimming alongside 40,000 pound whale sharks – who are, after all, merely plankton eaters – there is now a newer, much scarier option: swimming with real sharks. No, this isn’t a cage dive in a carefully controlled environment, but an uncaged, unscripted experience in the deep blue waters of the world’s largest and most abundantly populated ocean. This adventure of a lifetime is offered courtesy of Cabo Shark Dive, the first dive company in Los Cabo to take thrill seekers offshore for Pacific Ocean encounters with makos, hammerheads, blues, sickle silks and other menacing looking shark species. Organized by Jacopo Brunetti, AKA Jacob Scuba – the founder of Cabo Shark Dive and a respected marine biologist, underwater photographer and certified shark expert – all tours include tested and reliable safety measures, plus the required medical and communications equipment…just in case, you understand. In addition to the adrenaline rush of free diving with prehistoric eating machines, divers invariably encounter other large pelagic species as well, from marlin and manta rays to dolphins and sea lions. Cabo Shark Dive, Cabo San Lucas Marina, Dock O (in front of Captain Tony’s restaurant, Cabo San Lucas, (624) 155-8246, info@cabosharkdive.com, www.cabosharkdive.com. Open daily 7 a.m. to 8 p.m. All major credit cards accepted. Photo credit: Cabo Shark Dive. 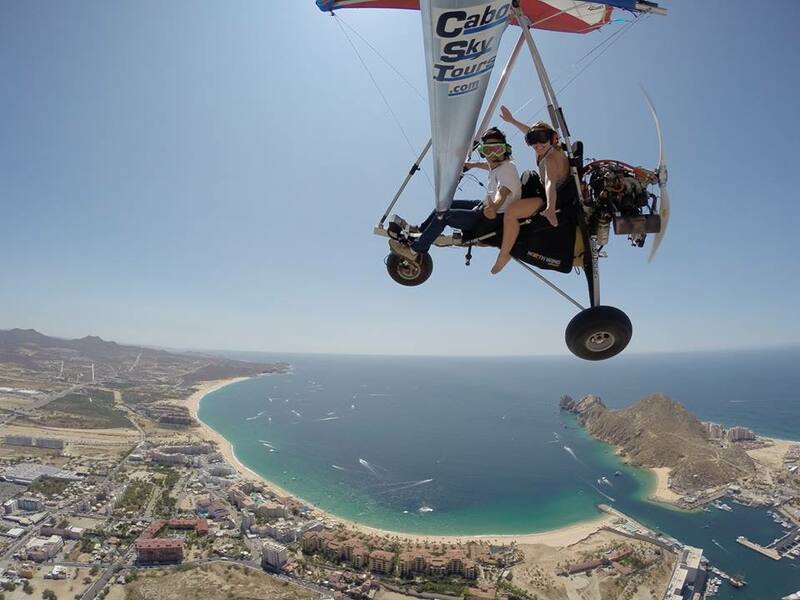 The best views in Los Cabos aren’t found in the penthouses or rooftop lounges of local luxury resorts, but rather in the passenger seat of pilot Ernesto Magaña’s motorized hang glider. If it seems terrifying, that’s because it is. But Ernesto has been flying for over 3o years, and offers the only opportunity to view local landmarks like Land’s End and Médano Beach from 1,000 feet in the air. Ten to twelve minute Land’s End tours are entry level. For the full adventure, opt for the hour-long Kings Sky Tour, and experience the majesty of the southern Baja coastline from Cabo San Lucas to San José del Cabo and back again. Cabo Sky Tours, Camino Viejo a San José, Col. Médano, Cabo San Lucas, (624) 144-1294 or (624) 150-1000, ernestoloscabos@gmail.com, www.skytourscabo.com. Contact Ernesto Magaña for scheduling information and payment methods. Photo credit: Cabo Sky Tours. 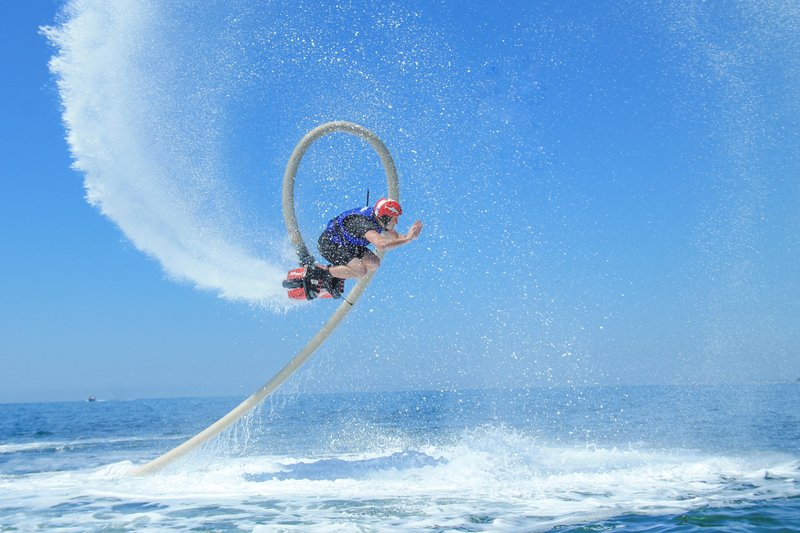 Flyboarding is one of the world’s newest sports, emerging as recently as 2011 when it was created by a French jet ski champion named Franky Zapata as a kind of futuristic “jet-powered hoverboard.” The jet ski, or wave runner if you prefer, does play a major role: when the jet ski rider revs the throttle, a surge of water gushes through an attached hose, propelling the flyboarder out of the water, and allowing him or her to elevate and steer into turns or flips up to 35 feet above the surface. Flyboarding took Cabo by storm when it appeared here in 2013, with participants soaring like superheroes high above Cabo San Lucas Bay: shooting straight out of the water like Superman, or gliding over the surface like Silver Surfer…all to the delight of bikini and board shorts clad crowds on Médano Beach. Cabo FlyBoard, Avenida del Pescador (behind Casa Dorada), Local 6, Playa El Médano, Cabo San Lucas, (624) 143-0146, info@caboflyboard.com, www.caboflyboard.com. Open daily 9 a.m. to 5 p.m. All major credit cards accepted.